Here is another great opportunity for the jobinassam readers. www.jobinassam.in has bring Bodo, Hindi and Manipuri Medium TET 2017 news for you. Rmsaassam.in has published a recruitment notice for the Graduate candidates in Assam. 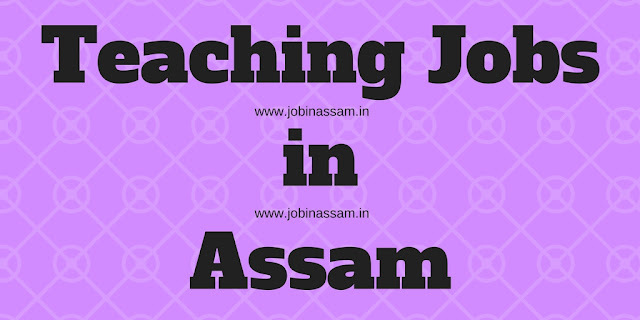 There are vacant posts for Bodo, Hindi and Manipuri Medium Graduate teacher job in Assam. Applications for appearing in the Teachers’ Eligibility Test (TET) are invited from the intending candidates for Graduate Teachers in Secondary Education Assam for Bodo, Hindi and Manipuri Medium Only. The Candidate must be a Citizen of India and must be a resident of Assam. RMSA invites applications from the eligible candidates to recruit in the following posts. You can view the details of eligibility criteria and other important things below. Require Age- Age of the candidate must not less than 18 years of age and not more above 43 years as on 01.01.2017. Relaxation of upper age limit will be applicable for SC, ST(P), ST(H) for another 5 years as per Govt. of Assam OM No. ABP.06.2016.04 dated 03.03.2016. The upper age limit may also be relaxed in case of candidates who are working under the scheme of “Strengthening and Improvement of the Quality Education in the State” or contractual terms for a maximum period up to 5 years ans willing to take part in the instant TET. The Assam Secondary Education (Provincialised) Service (Amendment) Rules, 2012 has prescribed the amended qualification for direct recruitment to the post of Graduate Teachers. The Candidate must be a Citizen of India and must be a resident of Assam. He/she must be a Graduate having 50% marks from a recognized University with B.T/ B.Ed. from a recognized University. 2. For Bodo Medium: The candidate must have passed HSLC or equivalent examination with Bodo language as one of the subjects or read up to HSLC level in Bodo medium school. For Hindi Medium: The candidate must have passed HSLC or equivalent examination with Hindi language as one of the subject or read up to HSLC level in Hindi medium school. For Manipuri Medium: In case Manipuri medium the candidate must have passed HSLC or equivalent examination with Manipuri language as one of the Subject or read up to HSLC level in Manipuri Medium School. These posts are advertised by rmsa.in to recruit eligible candidates for Graduate Teachers in Secondary Education Assam for Bodo/ Hindi/ Manipuri Medium. You can apply for the post if you have the eligibility mentioned above. Process of Application- Application process for this Permanent Teacher job in Assam is online. Detailed instruction on filling up of online application form will be uploaded in the website www.rmsaassam.in. For more information on TET candidates may please contact all Inspector of Schools offices in Districts and their RMSA cells; State Mission Director RMSA Office, Kahilipara, Guwahati; Office of the Director of Secondary Education, Assam, Kahilipara, Guwahati during office hours on all working days. Validity of TET: All candidates who pass the TET will be awarded a certificate. The validity of the certificate shall be for a maximum period of 5 (five) years from the date of issue of the certificate by the Empowered Committee, Government of Assam subject to the condition that the candidate otherwise fulfils the eligibility criteria prescribed for recruitment to the services in Government of Assam. I have shared all the important knowledge for the upcoming Assam TET here. This is completely free service for from me. Graduate Teachers will be a good job for you if you are eligible for the post mentioned above, apply before the last date. Moreover, monthly pay for the Regular Graduate Teachers job in Assam is also good.